The best things in life are simple and this instant strawberry cashew ice cream with just 4 ingredients is a perfect example. No churning or waiting is required, just a minute of blending and you will have frozen and thick ice cream. 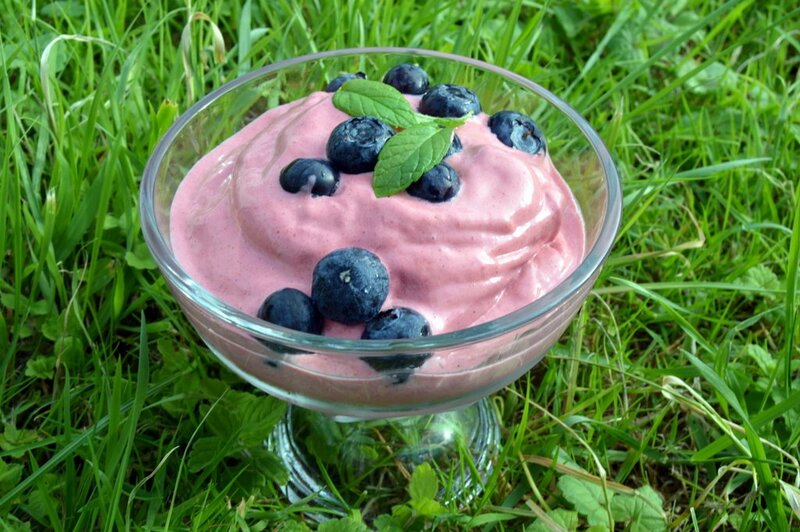 You need not tell anyone it’s raw vegan – they won’t notice and just think it’s a delicious strawberry ice cream. The trick to this quick recipe is to use frozen strawberries. You can buy these pre-frozen or freeze your own, but you will need to de-stem before freezing. It’s reasonably firm but will melt quickly so either make and serve immediately or put straight into the freezer. It’s a lot more solid than the pictures and video show – it melted quickly in the 5 minutes while fiddling with the camera. I do have an ice cream maker but since i discovered how quick and easy it is to make instant blended ice cream I haven’t used it. Place the cashews, dates and vanilla in a blender and cover with water. Whizz up until all is smooth. Add the frozen strawberries to the blender and then blend again until they are all broken. If you have a blender with a tamper you can use this to push the strawberries towards the blade. You may need to add more water if it isn’t mixing or more frozen strawberries if its too runny. It should be frozen enough that you can turn the blender upside down and none falls out.